Our 10-Person Triage & ICS Base System is a comprehensive solution for setting up a large scale triage and incident command operation at the scene of a natural disaster. This system will allow response teams to set up a triage and ICS area quickly to coordinate team members, help victims and save lives. 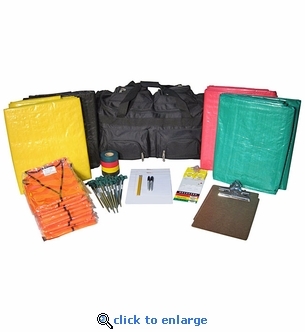 This triage & ICS base system comes ready to go in a wheeled heavy duty 30" duffle bag. Pair this system with our Triage Kit Modules and Multi Person Trauma Kits to provide a turnkey solution for incident command and triage. ICS & Triage Binder with instructions, leader board and more. 2 Clipboards 9" x 12"
2 Office Note pads 8 1/2" x 11"